Groups must be 10 or more for a Dinner Reservation! “Great find when we drive around for dinner spot” - We drove around with no guidance in search of food and found this place packed on a Thursday night. Great food and wine! Will return again. “Outstanding!” - What can I say! 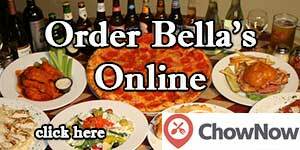 Bella's is well known for the best food by it's regular and returning customers for years. Located in the Food Lion Shopping Center,I often see a line out the door of people gladly waiting for their turn to enjoy the delicious food. Food is made to order so please be patient. It is worth it! “The best surprise in Western NC” - This was a wonderful surprise, The best Italian food we have had in ages. The best pizza since we left New York, Clam Chowder to rival anything I have had in New England. If you are in the area, and you like Italian (and who doesn't like a good Pizza?) Go and give it a try.